Think of the world’s great Xmas markets and cities such as Berlin, Prague, Cracow and Brussels will probably spring to mind. These days even London’s Southbank boasts an imitation, but this year in the company of a couple of close friends we decided to sample one on our own Lake Como doorstep, Oh Bej , Oh Bej, nestling beneath Milan’s historic Castello Sforzesco. The tradition dates way back to 1510 when a religious figure arrived in town with presents for all the children. When they opened them they shouted “Oh Bej! Oh Bej!” – “How Beautiful! How Beautiful!” and this year, as Milan basked in temperatures of 15 degrees under clear blue skies, we were tempted to shout the same! Milan’s annual Christmas festival comes alive each December 7th – the day of Sant’Ambrogio, the city’s patron saint –climaxed by the Sunday parade of 70 figures in sixteenth century dress. Part-fair and part-celebration, this year was one of the largest in recent memory hosting 400 different stalls in double file around the castle selling everything from flowers and food to antiques and crafts, accompanied by performances by musicians, jugglers and street performers. Of course, eating and drinking is very much part of “Milanese” custom too so, having only enjoyed a quick cappuccino on arrival at Milan’s Central Station – a tourist attraction in itself if you have time –we determined to sample some of the market’s gastronomic delights including porchetta Panini and strings of the traditional roasted chestnuts washed down by a glass of vin brûlé or mulled red wine. Weighed down with some wonderfully quirky Xmas presents – even the mother-in-law will enjoy her fruit bowl shaped like an elephant! 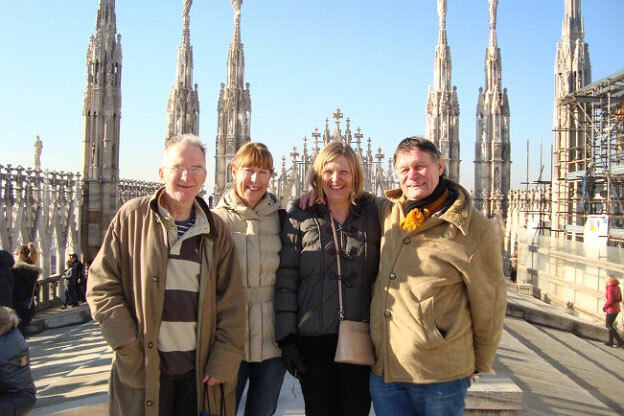 – we headed off to the Piazza Duomo to experience yet another magical Xmas market of over 100 stalls arranged around Milan’s magnificent cathedral. Finally “shopped out”, we took time to take in the amazing panorama atop the cathedral’s roof before wending our way back to Centrale via the stunning Victor Emmanuel Gallery and Quadrilatero della Moda , the fashion quarter, where sadly we discovered we didn’t have quite enough money left to buy even a pair of pants! It really is a great time of year to see how Milan and the Milanese celebrate Xmas but also to enjoy a wonderful winter break on Lake Como, looking even more beautiful in the sunshine and without the crowds. We’ll certainly be coming back next year though we may have to start saving for those pants!